I love making lingerie. I never thought I would say that, but I’ve truly fallen head over heels in love with everything about the process – from planning, to executing, to wearing. It seems silly to pour a lot of time and energy into something that doesn’t get seen by the majority of the public (blog posts notwithstanding, of course ;)), but it’s actually strangely fulfilling to know that you’ve made every last piece of clothing you’re wearing down to the underwear. The process itself is also incredibly appealing to me, as it deals with a lot of tiny pieces and a lot more finicky stitching – don’t ask me why, but I just can’t get enough of it! Ever since I took my first dive into the world of bra-making, I’ve kept an eye on the Mood Fabrics website for suitable fabrics to turn into gorgeous lingerie. The AWESOME thing about sewing bras is that it doesn’t require a lot of fabric – you can get away with 1/4 yard (or even less, depending on your size), which means those expensive yardages suddenly fit neatly in your budget. For this colorful lace number, I zeroed in on this cool Multicolored Tropical Lace fabric at Mood. Isn’t it beautiful? It’s a nylon embroidered lace with a bright all-over floral pattern printed right on top. It also has a cool finished edge (unfortunately too abstract for me to include in this project, but it’s there!). There are a few different colorways of the lace, which meant I spent about a week agonizing over which one to get – blue/purple, red/green, blue/beige, and beige – but I settled on this multicolor as I liked the pink repeats with the white background. I’ll be honest – I wasn’t sure how this was going to pan out, because I haven’t spent very much time making bras without the guidance of a pre-cut kit (where someone else gathers the fabric and notions for you). I like the kits because it takes out the guesswork of choosing the correct fabric – the pattern I used requires a fabric with minimal movement, about 10%, and finding that happy medium can be a little difficult if you don’t know why you’re looking for. I also like the kits because they find all the elastics and stuff for you without you having to shop to the ends of the earth 🙂 That being said, I have spent quite a bit of time shopping for lingerie elastics and supplies over the past few months, and as a result I have a pretty impressive collection of stuff that needs to be used. So I woman’d up, I bought the fabric, I raided my stash, and I went my own way. Thankfully, it turned out pretty good! The pattern I used for this bra is the Marlborough Bra from Orange Lingerie. I’ve made this pattern several times already, so I am pretty comfortable with the construction process and I’m happy with the fit. 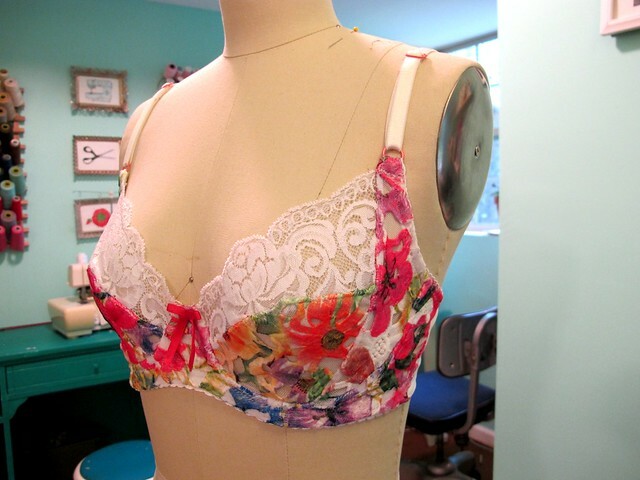 I used the aforementioned multi colored floral lace for the body of the bra, and cut it according to the grainline on the pattern pieces (as I’ve mentioned, this pattern requires about 10% stretch in the fabric, which usually means cutting it on the bias for firm wovens. This lace had just enough mechanical stretch so that I could cut it according to the pattern grain). Since the lace has giant open holes throughout it, I underlined each piece with a layer of power mesh (from my stash) to add a little bit of opacity. The back band is cut on one layer of power mesh. The white lace upper cup is cut using stretch lace from my stash. This pattern calls for non-stretch lace, but I’ve found that I prefer the shape I get when I use stretch lace. For the notions, I decided to go with all white so that the colors in the fabric would really sing. All notions were pulled from my giant stash – the elastics, strapping, underwire, casing, and hook and eye are all new. The front bow, rings and sliders are all rescued from an old bra. Sewing this was super straight forward – the directions in this pattern are excellent (seriously, my very first bra I ever made was from this pattern and it certainly does not look like a first bra!). I used temporary spray adhesive to tack the fabric and power mesh together before sewing each seam, and I serged all my finished edges with a 3 thread overlock. I’ve found that using an edgestitching foot is helpful for getting a nice even topstitching line, especially with fabric like this as the lace tends to be a bit lumpy when you’re trying to sew tiny 1/4″ seams. I was afraid this bra would be one of those that’s too fancy to wear for every day – mostly because, like I said, the lace is pretty lumpy! But it actually has a fairly smooth silhouette underneath my fitted tops. Of course, the colors are too bright to wear under white, but that’s ok with me 🙂 Means I better get started making more bras!